SYDNEY – Asia shares were subdued on Tuesday while the dollar relapsed as investors raced to book profits on its post-payroll gains despite all the talk of a U.S. rate rise as early as September. China reported another soft reading on inflation as the consumer price index slipped 0.2 percent in May, from the month before, to be up 1.2 percent on the year. The tame result only added to expectations that more policy stimulus would be forthcoming from Beijing and limited the damage to stocks. 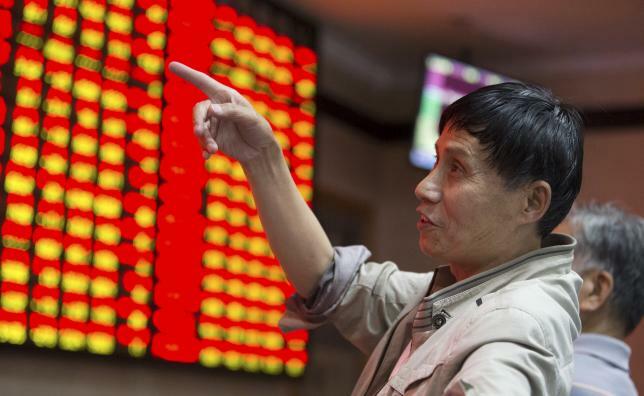 Shares in Shanghai eased 0.3 percent while the CSI300 index was little moved. Both indices were near seven-year highs on speculation MSCI might decide to add Chinese shares to its global index. An announcement is due later Tuesday on whether MSCI will include China ‘A’ shares in its Emerging Markets Index, either partially or in full. Analysts at HSBC estimate a partial inclusion of China A shares would lead to passive inflows of around $3 billion, while a full inclusion could see demand worth at least $47 billion. Markets in Korea, Taiwan, and India would likely suffer in terms of index weights and flows, they added. There was no clear trend elsewhere in Asia with Japan’s Nikkei off 0.7 percent and South Korea unchanged. MSCI’s broadest index of Asia-Pacific shares outside Japan were a fraction firmer having touched a 10-week low on Monday. On Wall Street, the Dow ended Monday down 0.46 percent, while the S&P 500 lost 0.65 percent and the Nasdaq 0.92 percent. Apple weighed most on the Nasdaq Composite and the S&P 500. It was down 0.66 percent after the iPhone maker unveiled a new music service. There was the usual caution over Greece where interminable debt talks showed no sign of ending soon. The Greek government did say it was ready to negotiate a settlement acceptable to both sides by the end of this month, just three days after Prime Minister Alexis Tsipras told his parliament the latest proposal from the EU and IMF was “absurd”. Yet there was no new proposal from Athens that its creditors could agree to, an EU official said. There was better news from Germany where industrial output beat expectations and helped ease fears of deflation. Yields on German 10-year paper climbed to 0.89 percent, while those on 10-year Treasuries dipped to 2.38 percent. As a result the premium offered by U.S. debt narrowed to around 149 basis points, having been as wide as 190 back in March. The dollar also took a hit from reports President Barack Obama had called the high currency a problem in talks at the G7, though the White House later denied he had ever said it. Federal Reserve and other officials have expressed concerns about dollar strength’s impact on growth and exports. Early Tuesday, the euro inched up to $1.1314 having recovered all of Friday’s drop to $1.1048. The dollar dipped just a little on the yen to 124.51, to remain within striking distance of the recent 13-year high of 125.86. The dollar index dipped 0.26 percent to 95.048 having shed 1.1 percent on Monday. In commodity markets, oil steadied after being hit by a slump in Chinese demand and worries that OPEC’s decision to pump crude without restraint could prolong the current supply glut.